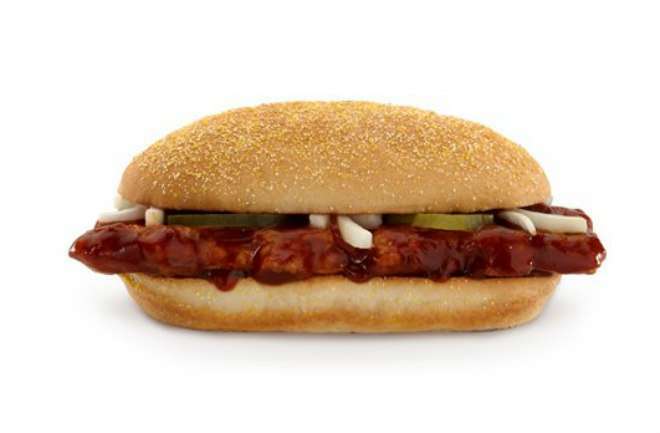 The approaching winter can mean only one thing: the return of McRib season at McDonald’s! The somehow still popular limited-time item features an unsightly ground pork patty (shaped to vaguely resemble a mini rack of ribs) slopped in barbecue sauce and thrown on a bun with a pickle or two and an onion sliver. Enriched Bleached Flour (Wheat Flour, Malted Barley Flour, Niacin, Reduced Iron, Thiamin Mononitrate, Riboflavin, Folic Acid), Water, [Gentically Modified (GMO)]Corn Meal, [GMO] High Fructose Corn Syrup, Yeast, [GMO] Soybean Oil, Contains 2% or Less: Salt, Barley and Malt Syrup, Wheat Gluten, Leavening (Calcium Sulfate, Ammonium Sulfate), May Contain One or More Dough Conditioners (Sodium Stearoyl Lactylate, DATEM, Ascorbic Acid, Azodicarbonamide, Mono and Diglycerides, Monocalcium Phosphate,Enzymes, Calcium Peroxide), Calcium Propionate (Preservative). One thing is for sure, McDonald’s has always had a phenomenal marketing department. The colors in the logo are a convincing combination in and of themselves. Red tends to make people feel passion, trust, and love; while yellow invokes the feelings of joy, feeling alive, and freshness. I know what you’re thinking, “fresh?” At least the preservatives might trick your mind into believing that it’s fresh! Their flawless advertisements placarding the restaurant windows do this feeling justice as well. PORK PATTY: Pork, Water, Salt, Dextrose, Preservatives (BHA, Propyl Gallate, Citric Acid). What are these preservatives and why are they in your beloved formed meat product? -BHA (Butylated Hydroxyanisole) prevents fats from looking and smelling rancid. It’s also commonly found in cereal, chips, and various processed foods made by mega corporations. When this preservative was tested in animals, it was found to cause cancer in the “forestomach.” Those who argue the safety of BHA state that humans have no forestomach, therefore it should be considered safe. However, the Center for Science in the Public Interest (CSPI) states that if a substance has been found to cause cancer in three different species, in this case rats, hamsters and mice, then the United States Department of Health and Human Services considers it to be a carcinogen. But as no surprise, the authoritative agency of food and drug-related tyranny (FDA) still allows the use of BHA as an additive. -Propyl Gallate is similar to BHA and both are commonly found in the same products together. Just as with BHA, the CSPI states that studies on the dangers of propyl gallate are mixed, but there is a chance that it can cause cancer, and should therefore be avoided. -Citric Acid in a McRib means they’re adding lemon juice to it in order to keep it fresh right? Perhaps in a perfect world, but it’s likely that they’re taking the more profitable road like their corporate brothers and using GMO black mold. Follow this link to learn more. As for the sauce, it doesn’t start out well with HFCS as the main ingredient which is often contaminated with mercury, and surely loaded with GMO corn. The sauce also contains GMO soybean oil. If that’s not enough, the chemical listed as caramel color on processed foods has been identified as a possible carcinogen. Back to the frozen meat patty picture that’s raising eyebrows and churning stomachs across the web. Judging from the boxes featured in the background, we’re assuming that the “Boeuf Canadien” is from the land up north. 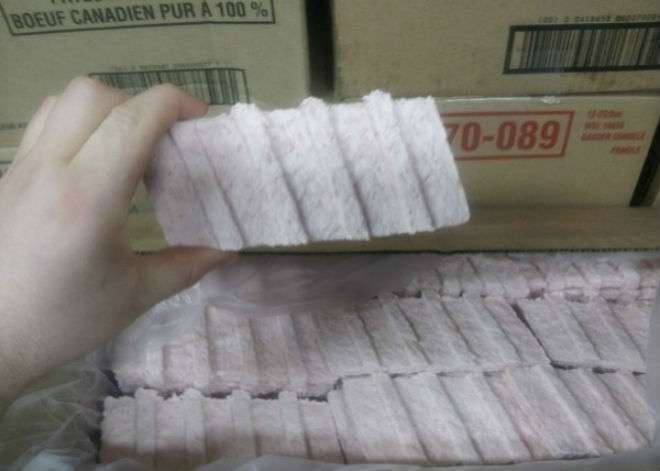 Naturally, this has prompted an onslaught of “McRibbed for Pleasure” cracks across the internet, while others are appalled that the guy in the photo didn’t use gloves. Thank goodness for priorities. 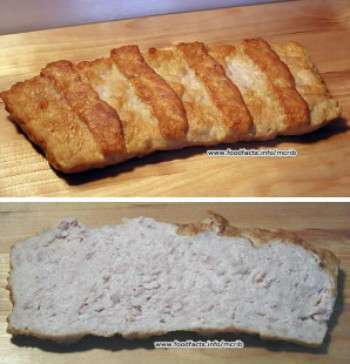 One reason our customers love the McRib is its fun and wonderful shape. Just like a burger patty is formed to be round and flat, we form the iconic McRib in the shape of traditional ribs. We then flash freeze the patty to seal in flavor and freshness, just like you freeze meat in your own freezer, before going to our restaurants. I can’t say I’m a customer but I certainly do not think the shape is fun and wonderful, let alone think the toxic ingredients are. If you have some friends and family that can’t resist the temptation for themselves or their children show them this, it might be all they need to get over the hump.